Defense Secretary Jim Mattis, right, and Joint Chiefs Chairman Gen. Joseph Dunford, center, speak with Chairman Sen. John McCain, R-Ariz., left, as they arrive to testify on Afghanistan before the Senate Armed Services Committee on Capitol Hill in Washington, Tuesday, Oct. 3, 2017. WASHINGTON — The U.S. military’s top leaders told lawmakers Tuesday that the thousands of additional U.S. troops President Donald Trump has ordered to Afghanistan will cost just over $1 billion a year, bringing the total bill for fighting America’s longest war to $12.5 billion annually. During wide-ranging hearings on Capitol Hill, Defense Secretary Jim Mattis also said that the United States should remain in the nuclear deal negotiated during the Obama administration that constrains Iran’s ability to build a nuclear arsenal. Trump has trashed the international accord, a cornerstone of Barack Obama’s presidency, as the worst agreement ever negotiated by the United States and signaled he may abandon the agreement. 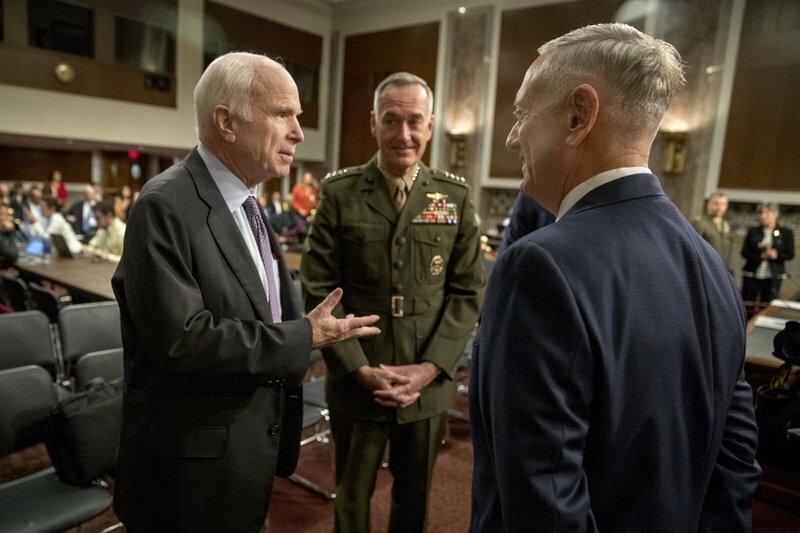 The release of the Afghan war cost information came as Sen. John McCain, R-Ariz., assailed Mattis and Marine Corps Gen. Joseph Dunford, the chairman of the Joint Chiefs of Staff, for withholding from Congress key details about Trump’s new strategy for winning in Afghanistan that was announced six weeks ago. McCain, the chairman of the Armed Services Committee, declared that it was “bizarre” that Mattis and Dunford did not submit written testimony before the hearing started. That’s customary practice for administration witnesses testifying before congressional committees. Mattis and Dunford, who appeared first before the Senate panel and later before the House Armed Services Committee, sought to assure skeptical lawmakers that Trump’s plan for expanding the U.S. presence in Afghanistan would pay off. Several members expressed concern the U.S. was wading more deeply into a conflict at great expense without prospects for long-term success. Mattis said that the Afghanistan military and police forces are fully engaged in combat operations for the first time during the 16-year-old war and are suffering fewer casualties as they continue to improve their competence on the battlefield. He added that the Afghan forces are becoming bolder in combat because they know U.S. and NATO forces are using airpower to strike the Taliban and other militants on “the high ground.” That frees up the Afghans to “take the fight to the enemy,” Mattis said. Dunford acknowledged, however, that the war in Afghanistan is currently a stalemate. “We’re not at a point where we can bring a successful political solution to the war,” Dunford said. Trump unveiled his new strategy for Afghanistan in August and said American troops would “fight to win” by attacking enemies, “crushing” al-Qaida, and preventing terrorist attacks against Americans. But Trump’s description of a win in Afghanistan notably did not include defeating the Taliban. He indicated that after an effective military effort it eventually may be possible to reach a political settlement in Afghanistan that includes elements of the Taliban. As part of the plan, the Pentagon is boosting troop numbers by about 3,500, augmenting the roughly 11,000 Americans currently stationed there. The increase will expand training of the Afghan military and beef up U.S. counterterrorism operations against al-Qaida and a growing Islamic State affiliate in Afghanistan, as well as the Taliban and other extremist groups. Trump also singled out Pakistan for harboring Taliban leaders and other militants that are battling American troops in Afghanistan. Trump’s tough words about Pakistan, a troubled U.S. security partner, infuriated Islamabad, which has denied the country provides safe havens for the Taliban. But U.S. officials and analysts have long said Pakistan tolerates the presence of the Afghan Taliban and the allied Haqqani network, which are leading the insurgency against Afghan and U.S. forces. Dunford told the committee that it’s clear to him that Pakistan’s intelligence service has connections to the terrorist groups. Congressional Democrats are increasingly worried Trump’s distaste for the Iran nuclear deal will lead him to abandon the accord and imperil the ability to contain Iran’s nuclear program. But Mattis said it’s in the national security interest of the United States to stay a part of the international accord. The U.S. military’s top leaders told lawmakers Tuesday that the thousands of additional U.S. troops President Donald Trump has ordered to Afghanistan will cost just over $1 billion a year, bringing the total bill for fighting America’s longest war to $12.5 billion annually.